Pothole accidents happen in many ways, and they can affect pedestrians, cyclists and even motorists. They can happen anywhere, in the street, or in a publicly accessible building such as a supermarket. They can also happen at work. If you have been injured to tripping on or falling down a pothole, no matter where it happened, then Accident Claims UK can help you claim compensation for falling down a pothole, for a wide range of injuries, such as a sprained ankle pothole injury. Call us on 0800 073 8801 to begin your claim today. Is the council liable for my injury? How much compensation could I get for a pothole accident? Why use Accident Claims UK for your claim? Key statistics pertaining to pothole-related accidents that happen in the UK. A definition of what a pothole or a slip, trip or fall injury is. A discussion of the liability of local councils across the UK to keep pavements in good repair. Information on claiming for a pothole accident in a public place such as a supermarket or restaurant. How pothole accidents can affect cyclists, and even cause a multi-vehicle road traffic accident. Information on how schoolchildren who are injured due to potholes in the school playground can be claimed for. Detailed instructions on exactly you need to do to have the best chance of making a successful claim for an injury caused by a pothole accident. A rough guide to how much you might be able to claim for a pothole accident, and a table of typical compensation amounts. Why you should consider using Accident Claims UK to make your pothole accident, and also an introduction to our national personal injury claims service. Regardless of how or where your pothole accident took place if somebody else was responsible for it happening, Accident Claims UK will be able to help you claim the compensation you are entitled to. Call us at the number at the bottom of this page today to begin your claim. Slip, trip and fall accidents are the single most common type of accident in the UK every year. And surprisingly, it is the second most common type of fatal accident. 15% of all fatal accidents in the UK every year are slips, trip or falls. Only road traffic accidents have a higher fatality rate. 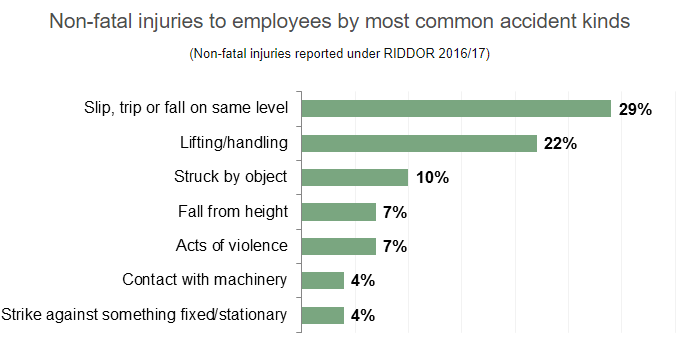 When it comes to accidents in the workplace, the single most common type of compensation that employees claim is slips and trips compensation. As you can see from the table above, 29% of all accidents in the workplace are slips, trips or falls. As you might imagine, we deal with many slip, trip and fall claims each year at Accident Claims UK. And we can help you with your claim, just call us on the number at the bottom of this page to find out how. In order to answer questions such as I fall in a pothole can I sue? and I fell due to a pothole in the street, is it worth making a claim? the deciding factors will be where the accident took place, and how the accident happened. Some pothole accidents occur while a person is carrying out their job of work, either on their employer’s premises, or that of a trading partner, customer or supplier. Other pothole accidents happen in a public place, such as a supermarket or restaurant carpark. And then there are the pothole accidents that happen on the public streets, which are the responsibility of the local council to maintain. Regardless of how and where your pothole accident happened, Accident Claims UK will be able to assist you in claiming the compensation you are entitled to. Call us at the number at the bottom of this page to find out how to start your claim. Every organisation in the UK, including private companies, Government run organisations and healthcare providers, are required by law to maintain a safe and healthy workplace for employees at all times. The UK Health & Safety Executive publishes strict guidelines on how every organisation is expected to maintain public thoroughfares. This means that if you are the victim of a pothole accident at work, and it can be proven that your employer has failed to maintain the required Health & Safety standards, you will have a viable route to claiming personal injury compensation. Call Accident Claims UK today, on the number at the bottom of this page, and speak to one of our work-related accident team to begin your claim today. As mentioned above, one of the main drivers in claiming compensation for falling down a pothole is where the accident took place. As with work-related accidents above, every private company that allows the public onto its premises, are required under legislation produced by the UK Health & Safety Executive, to maintain a safe environment for the public at all times. This means that if you have a pothole accident in the public carpark of any private company such as a hotel, supermarket, or restaurant, you should be able to claim compensation. Additionally, other organisations such as the public library, local train station, and even the police station have to operate under the same H&SE directives. So, if you fall foul of a pothole accident in any public place, you should be able to claim compensation. Accident Claims UK can help you, call us on the number at the bottom of the page. As with all claims against the council for personal injury, to sue the council for pothole injury you need to prove liability. The council is required to maintain all public footpaths, pathways and roads to a safe standard, as defined in Section 58 of the Highways Act, 1980. If you have tripped on or fallen down a pothole due to the council not doing their job properly, you will be able to make a claim. Accident Claims UK can help you claim against the council for a slip, trip or fall accident involving a potholed. Call the number at the bottom of the page to start your claim. If you were to ask a number of pothole claim solicitors if it is possible to claim for accidents that happen on private property, a typical answer would be “maybe”. In some cases, if it can be clearly proven that the owner of the land has failed to maintain a publicly accessible roadway, which has lead directly to the accident, a claim should be possible. However, the situation is far from simple. For example, if you were to have a pothole-related accident on a private property that you had no right to be on, then you likely won’t be able to make a claim. Solicitors treat Cyclist pothole claims in almost exactly the same way as a pedestrian accident. If the accident happens in a public place or on the street and the owner of the property or the local council are at fault, you will have a valid reason to make a compensation claim. On top of claiming compensation for the injury itself, you will also be able to claim compensation for any damage to your bicycle as well. If you call us at the number at the bottom of this page, we can help you start your claim. If a pothole on a public road causes a road traffic accident, then there will be a route to making a claim. 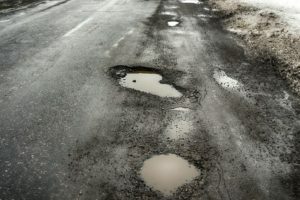 Potholes are not frequently the cause or car accidents, but they are a very common cause of motorcycle accident claims. Take plenty of photographs of the scene of the accident. Photograph the damage to your vehicle, and of course, photograph the pothole itself. If there were any witnesses, make sure that you take their names and addresses. There may be a need to get a statement from them in the future, to help you make your compensation claim. If you do both of these things above, then Accident Claims UK will have a much simpler time in claiming your compensation for you. Call us at the number at the bottom of this page to find out how we can help you claim. Every school is required by law, to maintain a safe environment for students at all times. This means the playground and outside areas, as well as inside the school buildings. Therefore, if your child is injured due to falling down a pothole, they will have a valid reason to make a pothole claim. However, it should be noted that you will have to claim compensation on behalf of young children, and this is something that Accident Claims Service can help you with if you call the number at the bottom of this page. In order to start a compensation claim for falling down a pothole, you first need to be sure that you have a valid reason to make a claim. For example, the answer to the question, how deep does a pothole have to be to claim? is that it needs to be deeper than an inch. If the pothole you tripped on is less than an inch deep, you might not be able to make a compensation claim. So, the answer to the question, if I fall in a pothole can I sue? is yes, if you have a valid reason too. The good news is, that if you call Accident Claims UK , we will be able to tell you very quickly, whether we believe you have a valid reason to make a compensation claim for an injury that resulted from falling down a pothole. Where and when did you trip over or fall down a pothole? Were you in a public place? Or on a publicly accessible private property such as a supermarket or restaurant? Has your injury been fully treated? Are there any expected long-term negative health effects of your injury? Have you had to miss work, or have you lost out on income in some way due to the injury? Have you had to pay any out of pocket medical expenses? These are the types of questions we will need to be answered before we can decide on how best to make your claim. Once we know this information, we will offer you some free legal advice on what to do next. In most cases, this will be to take advantage of the No Win No Fee personal accident claims service that we offer here at Accident Claims UK. We can also help to arrange for you to get an expert medical opinion to support your claim, and this means we will need to arrange a local medical examination. We operate local legal teams all across the UK, so if you feel you need to speak to a legal professional in a face to face meeting, we can likely arrange for one of our team to visit your home. Neck Injuries Minor to Severe £2,050 to £124,030 Little to no movement of the neck and severe that which have proved intractable. Back Injuries Minor to Severe £2,050 to £134,590 Extremely severe damage including the spinal cord and damage to nerve roots resulting in extremely serious consequences. Wrist Injuries Minor to Severe £2,940 to £50,050 Injuries resulting in complete loss of function in the wrist for example, where an arthrodesis has been performed. These are only estimated figures, for a much more accurate idea of how much compensation you could claim following a pothole injury, call Accident Claims UK on the number at the bottom of this page. Accident Claims UK offers our No Win No Fee national personal injury claims service, as the simplest, most effective and financially risk-free way to make a pothole claim. Under our No Win No Fee deal, there is absolutely no cost at all to start your claim. As we proceed to make your claim, no matter how long it takes, we won’t charge you any ongoing legal costs. And if for some reason, however unlikely, we fail to claim any compensation for you following your pothole accident, then you don’t need to pay us anything at all. The only time we will expect you to actually pay any legal fees, is when you receive a compensation payout. So, as you can see, our No Win No Fee claims service can help you claim for pothole accident, and you have nothing to lose, even if we don’t win your case. Accident Claims UK has a track record of claiming significant compensation payouts on behalf of our clients, which goes back more than three decades. Our legal team is highly experienced in claiming personal injury compensation from large organisations such as the local council, the National Health Service and large private corporation. While we are proceeding with your claim, we will always keep you up to date with regards to what we are doing to move your claim forward. We explain everything without using legal jargon. We always attempt to win you the most compensation we can but will never do anything that might jeopardise you winning the case. If you would like to learn more about how we operate, and how we can help you claim compensation following a pothole accident, give us a quick call at the number at the bottom of this page. If you are ready to begin your claim for compensation following a pothole accident, then call us now on 0800 073 8801. We will ask you some questions so that we understand your situation, before offering you some free legal advice on what to do next. We will also explain our No Win No Fee personal injury claims service, how it works, and why it is the most risk-free, simple and effective way to make a compensation claim. How To Claim Compensation After A Accident In a Public Place? Find out how you can claim compensation contact us for free legal advice.